The neat and tidy Cube 3D printer is on sale in the UK as of today, with Currys and PC World announcing availability of the kid-friendly device. Touting its plug-and-play out of the box simplicity, the retailer promises the table top printer is suitable and safe for children to use as well as parents. 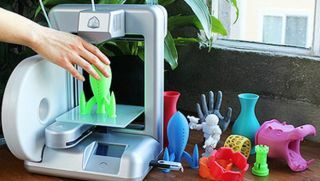 The £1,150 device from Cubify comes with 25 free 3D prints to get you started, while the bundled in software for Mac or PC will allow users to get started with their own designs. The device can print the creations in 16 colours of recyclable, compostable plastics, thanks to the range of cartridges, which are available for £52.80 a pop. The Wi-Fi connectivity and USB port negates the need for the printer to be physically connected to the computer, adding to the usability. The arrival of Cubify's product comes a few months after the first consumer focused 3D printer arrived in the UK. Back in July, Maplin began selling the Velleman K8200 machined for £699.